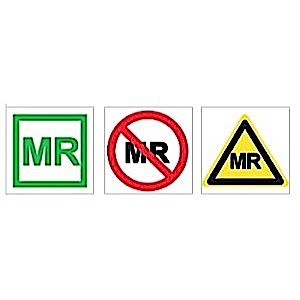 In conformance with the latest standards for MRI labeling, we have developed a new set of labels to properly mark your existing Magnetic & Non-magnetic supplies and equipment. Semi-permanent adhesive, easy peel backing for easy removal. All packs contain MR Safe, MR Conditional and MR Unsafe. Available in two sizes small: 1.5" and Medium 3.5"